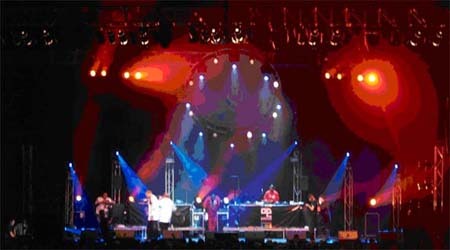 Americas Most Wanted Hip Hop Tour 2007 hit Sydney on the 23rd and 24th of February at the Sydney Olympic Park Sports Centre. Featuring an amazing lineup of the top US Hip-Hop Artists such as Bone Thugs N Harmony, Tha Dogg Pound, RBX and the Imperial Assassins. The lighting design and operation was by Mark Hammer assisted by CLS’ Giuseppe Colombo. Concert Lighting Systems supplied the lighting which consisted of 12 x Martin MAC2000, 12 x MAC700 profile, 8 x MAC700 wash, 16 x MAC600 wash, 16 x Pro Shop LED Honeycomb wall wash, 64 x Par 64’s, 6 x ETC source four profiles, 4 x Martin Atomic strobes, 24 x Source four parnels, and 3 x Lycian 1200 HTI follow spots. Control was by a MA Lighting grandMA console.